We have inherited the figure of the “tempestarii” from medieval wisdom and, in this specific case, he appears in the coast of Iceland where devastating natural events can throw us into lava fields and icy caves, driven by 100km/h arctic winds. In the black cliffs of the island, the tempestarii conjures up storms and their whirlwind of forces, combining disorder and renewal. The two artists and filmmakers, Gast Bouschet and Nadine Hilbert evoke these weather-charmer in the context of an immersive audiovisual and image experience that aligns contemporary art with meteorological magic and political activism. They will be joined by Stephen O’Malley, considered to be one of the hooded guardians of grandiose distortion, born out of from huge walls of amplifiers, guitar drones, cyclic waves of sonic pressure and improvisational explorations hailing from the darkest corners of the mind. Transiting between extreme heavy metal, doom, ambient and noise music, O’Malley is the founder of compelling projects such as Burning Witch, Khanate or the highly reputed, Sunn 0))). The colossal scale of much of his compositions is so overwhelming that it even blurs the trace of rational structure, appearing instead to br rooted deep visceral forces. After originally premiering in 2013, “Tempestarii” is different and unique in each performance. However it is based on reciprocity between sound and visual work. Together they walk along the razor’s edge that defines the encounter between art and magic, making it possible to meander between the possibility of participation in a game of forces that achieves a greater dialogue with the most intimate urges of our planet. Sector 2337, Chicago IL, U.S.
Tempestarii premiered in 2013 at CCR Dudelange, Luxembourg with a concert by Stephen O’Malley. Since then, the film has been screened at the legendary underground venue The Horse Hospital in London; Maus Hábitos, Porto, Portugal; University of Iceland Research Centre, Skagastrond, Iceland and Muzeum Sztuki, Lodz, Poland. Stephen has joined us again for live tempestarii action in September 2014 at The Wall in Taipei, Taiwan and for an exclusive opening performance of Les Rencontres Internationales at La Gaîté Lyrique, Paris, France in December. 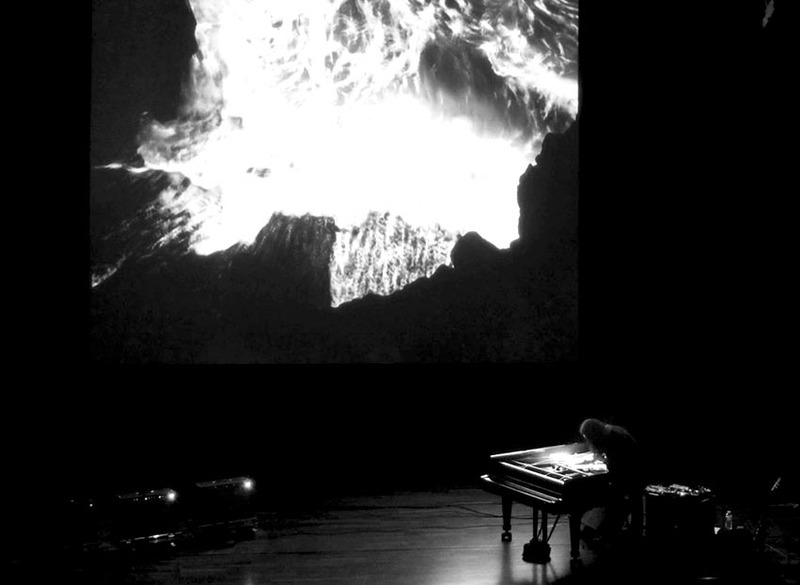 In 2015, we presented Tempestarii live at Bozar Brussels and Verdensteateret Cinema, Tromsø, Norway. Over the years Tempestarii has grown into a full-blown cinematic spell. We returned season after season to the northern edge of the habitable world to summon and experience the winds at war. Our elemental rite has been completed during the total eclipse over the Arctic on Friday, March 20, 2015. In the preface to Steppenwolf, the story of a wild man alienated from society, Hermann Hesse wrote, “Let every reader do as his conscience bids him.” Filter through enough disposable, formulaic music, and you wish you could swap out “reader” for “musician” and have these words stapled to the foreheads of music makers so they might see them in the mirror every morning. Do what you want. Create strange, terrible, mystical, terrifying and wonderful sounds. Do what your conscience bids you — the opposite of what it bids you, even. Just get off the path and into the cut. One person who has never needed encouragement when it comes to straying from the narrative is experimental musician Stephen O’Malley. A nomad in both the musical and personal sense, he’s moved around a lot over the years, starting out his life in the Pacific Northwest and eventually winding up in his current home base of Paris, France. Musically he’s migrated from doom to drone to noise to ambient to extreme metal and many esoteric points in between. Those who follow his work follow all of it — Burning Witch, Khanate, Sunn 0))). They scour the output of the labels he has been involved in running over the years, Southern Lord, The Ajna Offensive, and most recently Ideologic Organ. Intentionally or not, O’Malley has become one of the hooded gatekeepers of grand distortion born of stacks of Orange amplifiers, cyclic and droning walls of guitars, and improvisational explorations of the dark and beautiful corners of the mind. One of O’Malley’s current focuses is the art installation known as Tempestarii, a project by filmmakers Gast Bouschet and Nadine Hilbert for which he provided the sonic backdrop. The film follows a theme of repetition and disintegration, decaying further and further with each new cycle until viewers are left with nothing but a visage of stark oblivion. In the Luxembourg-born pair O’Malley has found the perfect collaborators, their art a visual representation of his aural expression and vice versa. Says O’Malley of working with Bouschet and Hilbert, “The thing I like about collaborating with people who are working in non-musical fields, there’s something to be said about being good at what you’re doing alone and to accept an external reflection on your work as direction from the collaborator.” Having worked together previously on another installation piece, Unground, which was performed live in a cave attached to the Casino Luxembourg last year, the trio has had time to get in tune with each other’s idiosyncrasies. Whether by process of collective evolution or by sheer force of creative karma, they have found their individual ideas falling into line with one another. O’Malley’s compositions are often of such a gargantuan scale in nearly every sense one can conjure that it can be hard to fathom that there is any rhyme or reason to it whatsoever. It’s difficult to imagine that it is anything but a spontaneous eruption of pure, unchecked emotion, but that simply isn’t true, and therein lies the essence of outsider art — challenging perspectives and deriving similarities from places where most would find none. In performing Tempestarii live, O’Malley accomplishes both. “There’s certainly structure, but I’m not working from scores and it’s not repetition,” he says before correcting himself slightly. “Well, it’s repetition in the sense that literally cyclic repetition is a big part of the forms of music I produce but there is a lot of improvisation involved. I think that’s really true with any live music, though. Even a string quintet is improvising, somewhat, and that just may be from the interpretation of what they’re reading. Each performance is a completely different experience.” Improvisation takes with it an inescapable feeling of running close to the edge. When the possibilities are virtually limitless, save for the physical limitations of the instrument you are working with, as O’Malley says, so too is the well of potential to send out the wrong vibrations, if there is such a thing with experimental music. But if you aren’t willing to walk along that proverbial razor’s edge, then you don’t belong in the cut, in the company of the sonic hermits weaving through the detritus to gain access to new territory. It’s daunting. It’s nerve-wracking. But it’s necessary. Stephen O’Malley will provide live music for the film Tempestarii on Thursday at The Wall, B1, 400, Roosevelt Rd Sec 4, Taipei City. Tickets are NT$1,000 in advance, NT$1,300 at the door. Doors open at 7:30pm and the performance will begin at 8pm. Dawn spreads its luminous rays across the coast of Iceland, revealing a sorcerer standing between wine-dark sea and mountainous black rock. It is tempestarii, a figure of medieval lore, undertaking a primitive rite manifested to conjure a storm. The tides of the deep ocean breathe heavily, rising and falling across the cinema screen with amplifying power as the weather-maker beats a mysterious sack against the monolithic cliffs with powerful repetition. As a magical tool, this sack contains forceful winds pulled from each corner of world. As an analogy, it is aligned with the revolutionary transformations of nature by water, air, solar radiation, and geological shifts and ﬁlled with the vast potential of man’s will in alliance with Nature. As an omen, the tempestarii signals profound change in both physical and metaphysical realms. Presented as both a live performance and an installation, Tempestarii is an immersive experience of video and sound. By recasting contemporary art as meteorological sorcery and political activism, the duo Gast Bouschet and Nadine Hilbert raise a storm and blacken the air. Earlier this year, the artists Gast and Nadine invited me to write the above introductory text and curate a short video program that would accompany the world premier of Tempestarii, their most recent video, which screened on 25 October 2013 as part of the Touch of Noir Festival at the CCR Opderschmelz in Dudelange, Luxembourg. I have been working with Gast and Nadine for about two years, during which time they have worked extensively within the Icelandic landscape to create both Tempestarii and the multi-screen installation Unground (which exhibited from December 2012 to January 2013 at Casino Luxembourg and will be reimagined for CubeSpace, Taiwan, in September 2014). Additionally, they are currently developing an artists’ book of photographic images taken in Iceland that will be published in Spring 2014 as Transcendental Geology. Their work enchants me, and not only with its intellectual richness; Gast and Nadine’s incorporation of alchemical aesthetics are absolutely gorgeous, and their collaborations with noise musicians add intense layers of somatic and psychological stimulation. Gast and Nadine’s Tempestarii presentation at CCR Opderschmelz comprised three events, which spanned ten days (from 25 October–3 November). Throughout this span of time, the artists presented alchemical bursts of light, sound, and space to enliven and empower the night air and charge it with dynamic meaning. 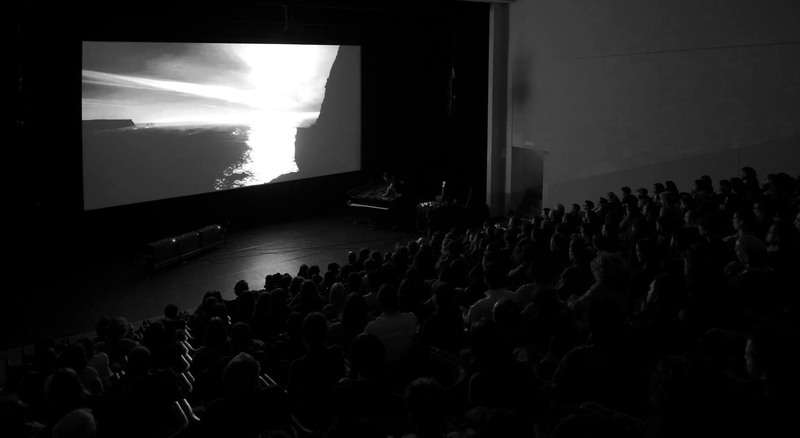 The opening performance event on 25 October introduced the Tempestarii video and was accompanied by a live musical performance by Stephen O’Malley that included piano feedback, guitar, and field recordings. This premier was preceded by Prelude: The Breath of Charybdis, a program of videos by the artists Semiconductor, Jon Cates, and Aldo Tambellini that I selected especially for this event. Together, the artists focused and directed our ideas, spirit, and energy on the complex potentiality and creativity of the darker months to come. In the days following the performance, Gast and Nadine’s video and sound installation DISintegration continued until the final night of the exhibition. When these events ran their course, the galleries were dark and silent, yet the air around them seemed potently transformed. In December 2013 I joined up with The Weight of Mountains filmmaker’s residency at Nes Artist Residency in Skagaströd, Iceland, where I delivered an early version of this essay and screened Prelude: The Breath of Charybdis and Tempestarii at the University of Iceland Research Centre. Nes provided me with an opportunity to regroup, proffer, and expand upon some of the concepts that Gast, Nadine, and I had spent many months developing. This article is an extension of that presentation. There is a tale from Aristotle’s Meteorologica that recounts the origin of the mountains.2 It begins with Charybdis, the daughter of Poseidon “God of the Sea.” Charybdis lives within the ocean, where her exhalations and inhalations cause the tides to rise and fall. When she took her first gulp, the sea drew back and exposed the earth. 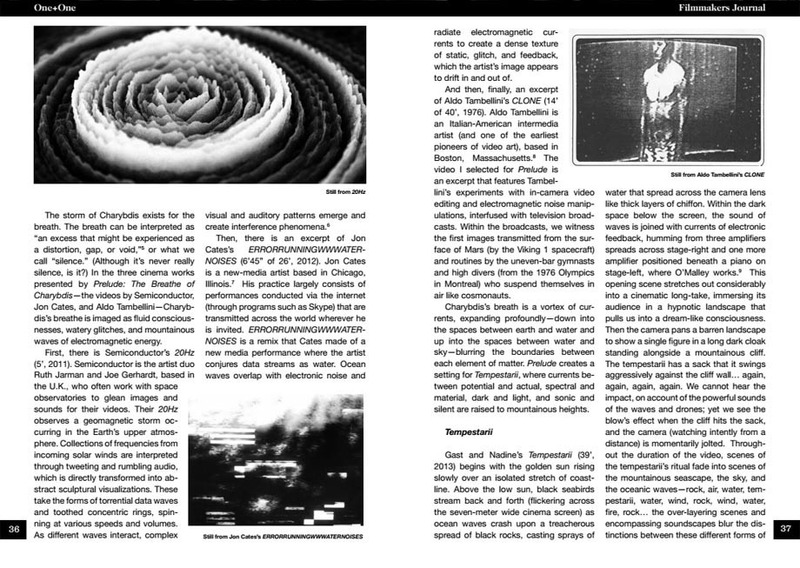 Charybdis captures and releases: revealing and concealing perceivable worlds. This mythical figure also appears in Homer’s Odyssey, where she takes the form of a whirlpool located within the Strait of Messina and threatens to swallow Odysseus’s ship whole. Later, Edgar Allen Poe encounters a similar phenomenon off the Norwegian coast in A Descent into the Maelström: a terrific spinning funnel of smooth, shining, jet-black water that descends at a forty-five degree angle to an unperceivable depth; its edges are lined in a gleaming vaporous spray; the teeth of its tempest winds emit a shrieking roar. Prelude: The Breath of Charybdis draws upon the accounts of these poets and philosophers to evoke a dynamic environment. It is not the embodied Charybdis that this program seeks to present, but rather a manifestation of her inspiration. Air was forced into an elastic sac at the bottom of a frog’s mouth. The lungs pushed and the sac inflated, and when released out came the croak. The air was modulated by frog tissues, sampled briefly and repackaged, returning to the ambient atmosphere as a low rasp with high harmonics. The sound was made of myriad waves crisscrossing in the air. Fingers switched on an MP3 recorder outside the suburban house. The wave front entered the microphone along with countless of its sonic cousins. A software-driven sampler took 44,000 tiny impressions of the sound per second and stored it in the device’s memory. I would like to propose here, then, that the breath of Charybdis is a terrain within which tempestarii might dwell. The breath is not the storm, per se, but the potential space that the storm emerges from; it is the calmness around the storm that defines the space or atmosphere interrupted. By concentrating on the breath, Prelude seeks to draw a perimeter around the area of focus—the coast of Iceland, or the dimensions of the cinema screen—and to preemptively “bind” this space or location with light and sound, in anticipation that it will be broken into by the Tempestarii video. The storm of Charybdis exists for the breath. The breath can be interpreted as “an excess that might be experienced as a distortion, gap, or void,”4 or what we call “silence.” (Although it’s never really silence, is it?) In the three cinema works presented by Prelude: The Breathe of Charybdis—the videos by Semiconductor and Jon Cates and the film by Aldo Tambellini—Charybdis’s breathe is imaged as fluid consciousnesses, watery glitches, and mountainous waves of electromagnetic energy. Then, there is an excerpt of Jon Cates’s ERRORRUNNINGWWWATERNOISES (6’45” of 26’, 2012). Jon Cates is a new-media artist based in Chicago, Illinois.6 His practice largely consists of performances conducted via the internet (through programs such as Skype) that are transmitted across the world wherever he is invited. ERRORRUNNINGWWWATERNOISES is a remix that Cates made of a new media performance where the artist conjures data streams as water. Ocean waves overlap with electronic noise and radiate electromagnetic currents to create a dense texture of static, glitch, and feedback, which the artist’s image appears to drift in and out of. And then, finally, an excerpt of Aldo Tambellini’s CLONE (14’ of 40’, 1976). Aldo Tambellini is an Italian-American intermedia artist (and one of the earliest pioneers of video art), based in Boston, Massachusetts.7 The video I selected for Prelude is an excerpt that features Tambellini’s experiments with in-camera video editing and electromagnetic noise manipulations, interfused with television broadcasts. Within the broadcasts, we witness the first images transmitted from the surface of Mars (by the Viking 1 spacecraft) and routines by the uneven-bar gymnasts and high divers (from the 1976 Olympics in Montreal) who suspend themselves in air like cosmonauts. Charybdis’s breath is a vortex of currents, expanding profoundly—down into the spaces between earth and water and up into the spaces between water and sky—blurring the boundaries between each element of matter. Prelude creates a setting for Tempestarii, where currents between potential and actual, spectral and material, dark and light, and sonic and silent are raised to mountainous heights. Gast and Nadine’s Tempestarii (39’, 2013) begins with the golden sun rising slowly over an isolated stretch of coastline. Above the low sun, black seabirds stream back and forth (flickering across the seven-meter wide cinema screen) as ocean waves crash upon a treacherous spread of black rocks, casting sprays of water that spread across the camera lens like thick layers of chiffon. Within the dark space below the screen, the sound of waves is joined with currents of electronic feedback, humming from three amplifiers spread across stage-right and one more positioned beneath a piano on the stage-left, where O’Malley works.8 This opening scene stretches out considerably into a cinematic long-take, immersing its audience in a hypnotic landscape that pulls us into a dream-like consciousness. Then the camera pans a barren landscape to show a single figure in a long dark cloak standing alongside a mountainous cliff. The tempestarii has a sack that it swings aggressively against the cliff wall… again, again, again, again. We cannot hear the impact because of the powerful sounds of the waves and drones, yet as the cliff hits the sack the camera, watching intently from a distance, is momentarily jolted. 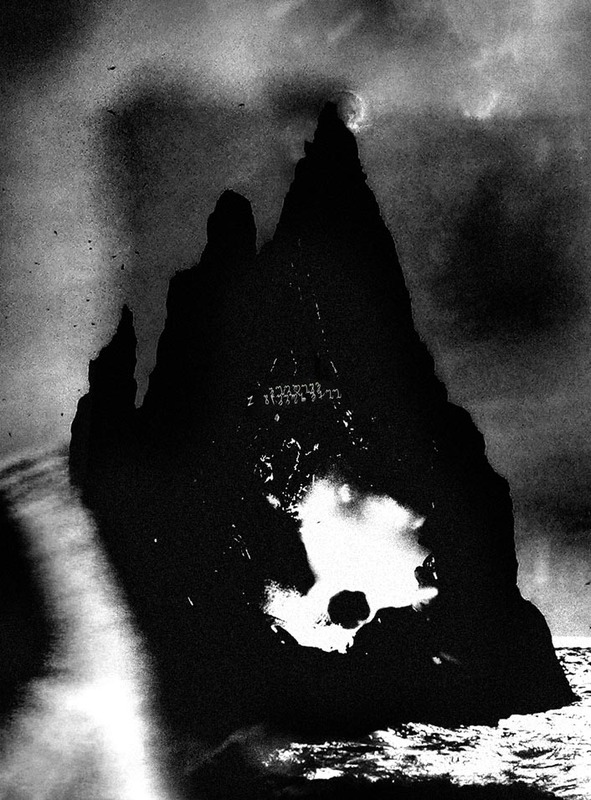 Throughout the duration of the video, scenes of the tempestarii’s ritual fade into scenes of the mountainous seascape, the sky, and the oceanic waves—rock, air, water, tempestarii, water, wind, rock, wind, water, fire, rock… the over-layering scenes and encompassing soundscapes blur the distinctions between these different forms of matter. Boundaries shift, appearing ethereal and obscure. It follows then that an image of a tempestarii is a tempestarii, and an image of a storm is a storm that could change the world. The location of Tempestarii, Iceland, may seem at times to be isolated from the rest of the world, but let us not forget that the geographic events here have historically reached across the globe. Most recently, we know of the volcanic eruptions of Eyjafjallajökull, from April to October 2010, which shut down the airways throughout Europe. However, if we reach back to the 18th century, the eight-month-long volcanic eruptions of Laki, from 1783 to 1784, are believed by scholars to have created conditions that contributed to the French Revolution—the dust and sulphur emitted from the volcano devastated crops and livestock, causing a vast famine, which led, in 1789, to one of the most significant events in the history of democracy.14 Moreover, many of the political writings that emerged from the Revolution are thick with references to natural disasters as analogies or impetuses for social and political changes. The People were characterized as Nature’s agents, and violence was naturalized as part of the regeneration process and portrayed as an unstoppable force of renewal. It is evident that humans are causing vast changes to the geological landscape. It increasingly seems as if a war has been declared against Nature. And Nature fights back. Beyond the volcanoes, earthquakes, hurricanes, and maelstroms already mentioned, there are also the consequences of geomagnetic solar storms—which, in March 1989, jammed radio signals across Europe and Russia and caused an electrical black-out across the provenance of Quebec.16 This same year, only months later, the storms returned and caused an electrical current surge that effectively shut down the Toronto Stock Exchange computers (seemingly targeting the seventh largest stock exchange in the world by market capitalization).17 These events were joined by some of the most spectacular “northern lights,” which could be seen as far south as Florida and Cuba. Meteorological magic is a way of connecting with the turbulent flows that shape our climate and weather patterns. Tempestarii is based on a multiplicity of interferences. Various systems exert their power and mutually influence one another. Through the perception of slow fluctuations and a constant shifting of form and content, we invite the viewer to engage in an inner experience with the performance of natural elements. Tempestarii aims to initiate a process of alliance with the daemonic otherness of storms, blizzards, air and sea currents, solar radiation, and geological formations. The idea is to participate in a play of forces outside the rational, human paradigm. Here, the mountains, the wind, the water, and the electromagnetic radiation appear to carry information from beyond. Of course, there is a level of disbelief that Tempestarii asks its audience to suspend. It is healthy to be skeptical. Perhaps it is not so easy to believe that Gast and Nadine could raise a storm by filming a ritual in Iceland where a sack (which looks suspiciously like one used to store regular potatoes) is struck against the side of a mountain to simulate raising waters and the crashing of waves upon rocks? A deeper question that is coated in a deep ambiguity stretches throughout the video: Is the tempestarii acting of its own accord to effect a sort of sympathetic magic upon nature, or is the tempestarii only a messenger of Nature’s whim? Would the sea react to what the tempestarii does, or is the sea telling the tempestarii what to do? It is not clear. Neither is it clear whether a storm is raised at all, for near the end of the video the tempestarii seems to dissolve into the face of the mountain—a transfiguration foretold by the numerous mountain silhouettes and shadows which appear to assume the form of the tempestarii, and by flexibility of matter demonstrated by ocean waters which frequently morph into flames or clouds. In the final moments of the video, it is not clear whether the white dust falling is snow, or ash, or stars. The spirit of the tempestarii was ignited by the opening night’s activities, and for the next nine days it continued to dwell within the CCR Opderschmelz in the form of DISintegration, an exhibition of video and sound projection. 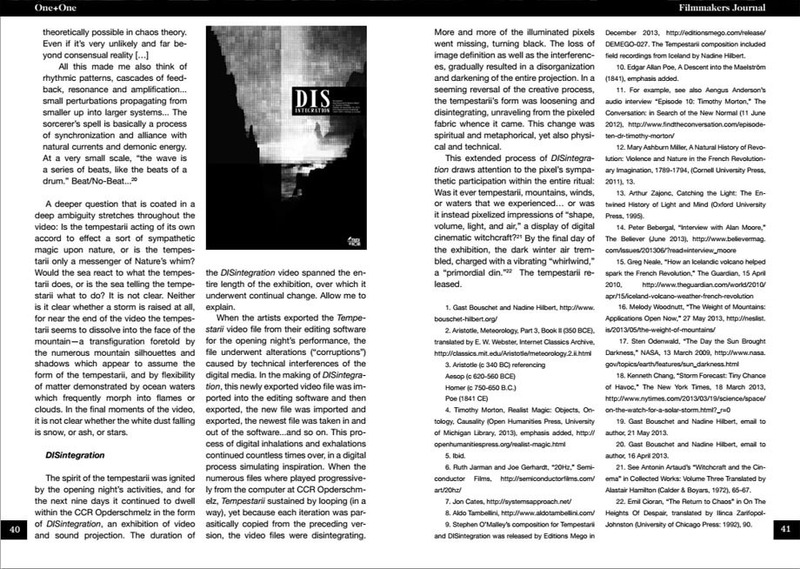 The duration of the DISintegration video spanned the entire length of the exhibition, over which it underwent continual change. Allow me to explain. 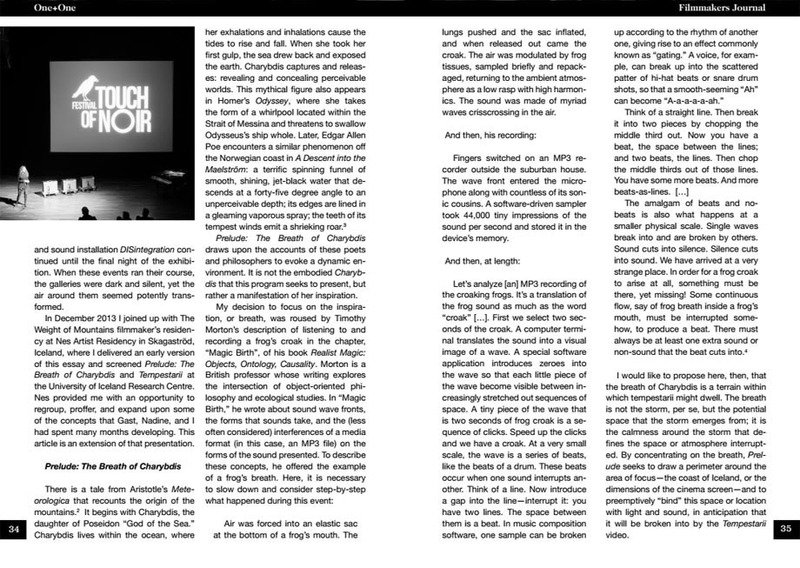 When the artists exported the Tempestarii video file from their editing software for the opening night’s performance, the file underwent alterations (“corruptions”) caused by technical interferences of the digital media. In the making of DISintegration, this newly exported video file was imported into the editing software and then exported, the new file was imported and exported, the newest file was taken in and out of the software…and so on. This process of digital inhalations and exhalations continued countless times over, in a digital process simulating inspiration. When the numerous files where played progressively from the computer at CCR Opderschmelz, Tempestarii sustained by looping (in a way), yet because each iteration was parasitically copied from the preceding version, the video files were disintegrating. More and more of the illuminated pixels went missing, turning black. The loss of image definition as well as the interferences, gradually resulted in a disorganization and darkening of the entire projection. In a seeming reversal of the creative process, the tempestarii’s form was loosening and disintegrating, unraveling from the pixeled fabric whence it came. This change was spiritual and metaphorical, yet also physical and technical. This extended process of DISintegration draws attention to the pixel’s sympathetic participation within the entire ritual: Was it ever tempestarii, mountains, winds, or waters that we experienced… or was it instead pixelized impressions of “shape, volume, light, and air,” a display of digital cinematic witchcraft?20 By the final day of the exhibition, the dark winter air trembled, charged with a vibrating “whirlwind,” a “primordial din.”21 The tempestarii released. 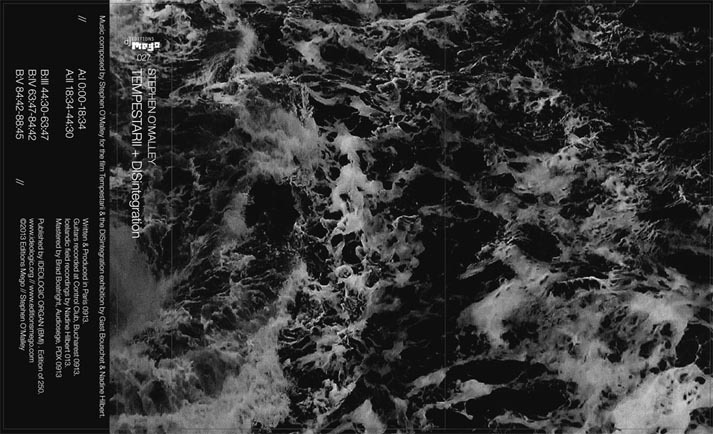 8 Stephen O’Malley’s composition for Tempestarii and DISintegration was released by Editions Mego in December 2013, http://editionsmego.com/release/DEMEGO-027. The Tempestarii composition included field recordings from Iceland by Nadine Hilbert. 9 Edgar Allan Poe, A Descent into the Maelström (1841), emphasis added. 11 Mary Ashburn Miller, A Natural History of Revolution: Violence and Nature in the French Revolutionary Imagination, 1789-1794, (Cornell University Press, 2011), 13. 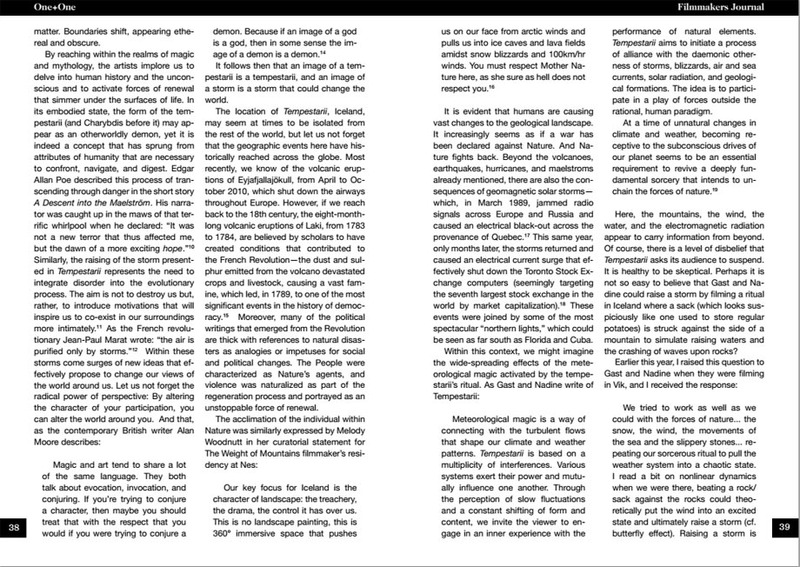 12 Arthur Zajonc, Catching the Light: The Entwined History of Light and Mind (Oxford University Press, 1995). 18 Gast Bouschet and Nadine Hilbert, email to author, 21 May 2013. 19 Gast Bouschet and Nadine Hilbert, email to author, 16 April 2013. 20 See Antonin Artaud’s “Witchcraft and the Cinema” in Collected Works: Volume Three Translated by Alastair Hamilton (Calder & Boyars, 1972), 65-67. 21 Emil Cioran, “The Return to Chaos” in On The Heights Of Despair, translated by Ilinca Zarifopol-Johnston (University of Chicago Press: 1992), 90. 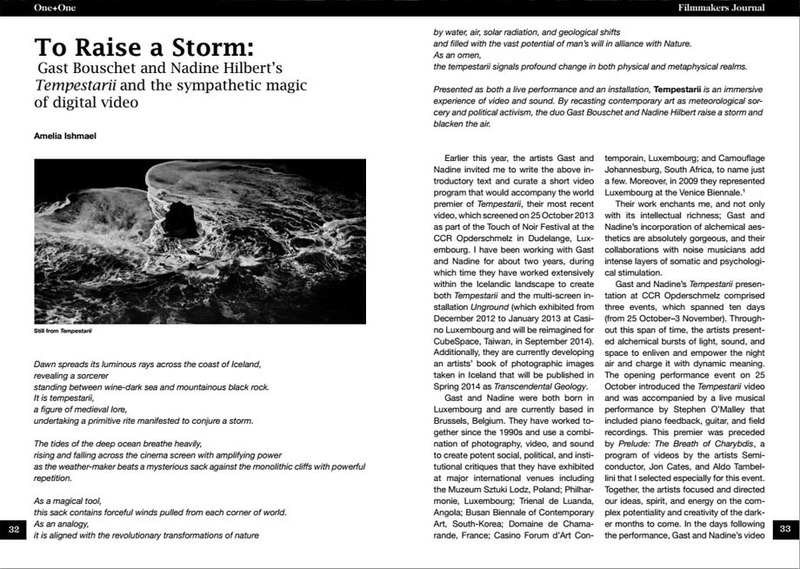 Excerpts from the premiere screening of Tempestarii at CCR Opderschmelz, Dudelange, Luxembourg on October 25, 2013. Music composed by Stephen O’Malley for the film Tempestarii & the DISintegration exhibition by Gast Bouschet & Nadine Hilbert. Written & Produced in Paris 0913. Guitars recorded at Control Club, Bucharest 0913. Icelandic field recordings by Nadine Hilbert 013.